In the beginning all work was done outside next to the locomotive. The area where the locomotive was stored was cleaned up (a continuing effort due to a homeless shelter nearby). An UP railroad box car was brought in on a nearby siding to provide storage for parts and a work place. Next electric power was brought onto the site and the boxcar wired for lights. The boxcar became our first workshop, but then quickly proved inadequate. When space in the north end of the Ogden Union Station was made available we immediately made plans to move. 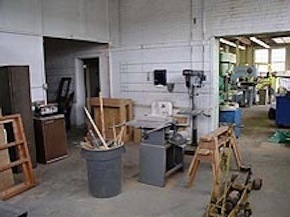 After the station area was cleaned up, the space was divided into three distinct work areas: metal shop, wood shop and assembly area. 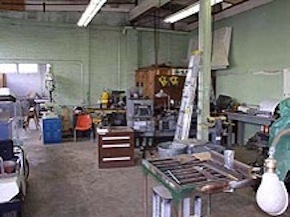 From a zero beginning we now have a secure work area with heat, fire protection, shop type electrical power and an assortment of shop tools and equipment. In the metal shop we now have two milling machines, drill press, bandsaw, press, grinders, welders, cut off saw and a lathe. In the wood shop we have a table saw, 8-inch long bed joiner and a drill press. We are still looking for more tools, especially woodworking. We still need a 14 or 16-inch wood cutoff saw, 20-inch planer, and a shaper. We also need one of our milling machines repaired. Check the 223 Current Activities for work in progress and/or completed steps in the restoration.